It seems only fitting that just a few days after International Childhood Cancer Day (15 February), a group of local Durbanites announced they would be partnering with Childhood Cancer Foundation South Africa (CHOC) to raise funds for the charity via a 36-Hour Action Cricket Marathon called “The East Coast Challenge”. This event, which is also set to be a Guinness World Record attempt, is due to take place at the Action Sports Centre in Durban North on the 9th and 10th of April 2016. “My team and I play action cricket socially and we have all known someone who has been affected by Cancer. The work that CHOC does and seeing the impact that they have on these kids’ lives is nothing short of extraordinary – and that’s what sparked the idea to take on something truly extraordinary to raise funds and support them! 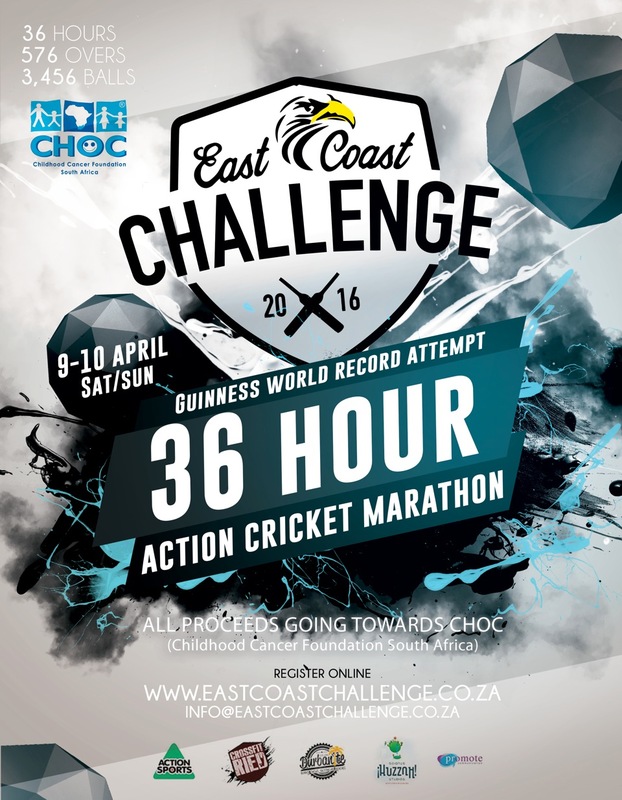 We are calling on all companies and individuals in the KZN area to enter a team for the East Coast Challenge and join us in putting on a brave effort over 36 hours with a bat and ball – all in the name of good fun and a worthy cause!” said Nick Ferreira, Freelance Photographer and Captain of the East Coast Eagles who are coordinating this event. The Childhood Cancer Foundation South Africa is a national organisation that was established in 1979. The main objective of CHOC is to support children with cancer; life-threating blood disorders and their families. CHOC provides the children with a home near the treatment centre. The children are also provided with clothing, food, recreational activities and much more. There are currently 10 CHOC houses and 3 CHOC lodges, however this foundation does not receive government support and relies solely on donations and sponsorships. To enter a team into the East Coast Challenge just visit the website, www.eastcoastchallenge.co.za and enter your details online. Alternatively – for more information about how you can get involved in this event, email info@eastcoastchallenge.co.za.